Sorry for the delay darlings! I know this was supposed to be posted here yesterday, but I ended up getting home from work real late. 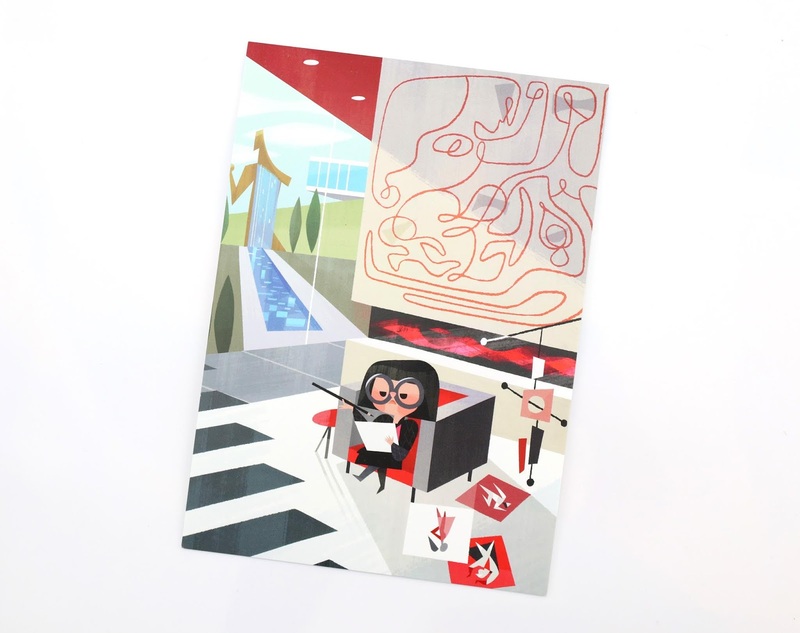 I'm back though and, as promised, here's my quick look and review of this fantastic new Incredibles 2 inspired postcard featuring art by Disney freelance illustrator Joey Chou—simply titled, "Edna." If you've been following my posts (or social media) for a while, you know how much I've gushed about Chou's work in the past. If you missed my reviews on his previous pieces, check them out HERE! He's done some amazing Pixar prints based on The Good Dinosaur, Up, Finding Dory, Cars and now The Incredibles. Though I categorize this art as "Incredibles 2" (since we're so close to the film, I imagine that's what prompted this release), this piece doesn't seem actually seem to be based on either of the two films; but rather just the character of Edna in general. First of all, everyone LOVES Edna. I mean, how can you not? She's absolutely a fan favorite and undoubtedly one of the funniest and most quotable Pixar characters to date. It was a unique choice to just focus on Edna here though, simply sitting in her house working on some of her super suite designs, but it totally works. It's very modern and minimal (just like Edna's house and her overall style), with some very "bold" and "dramatic" shapes, straight lines and pops of color. I love the feel— it's all incredibly cute and a nice tribute to the character. Classic Joey Chou. 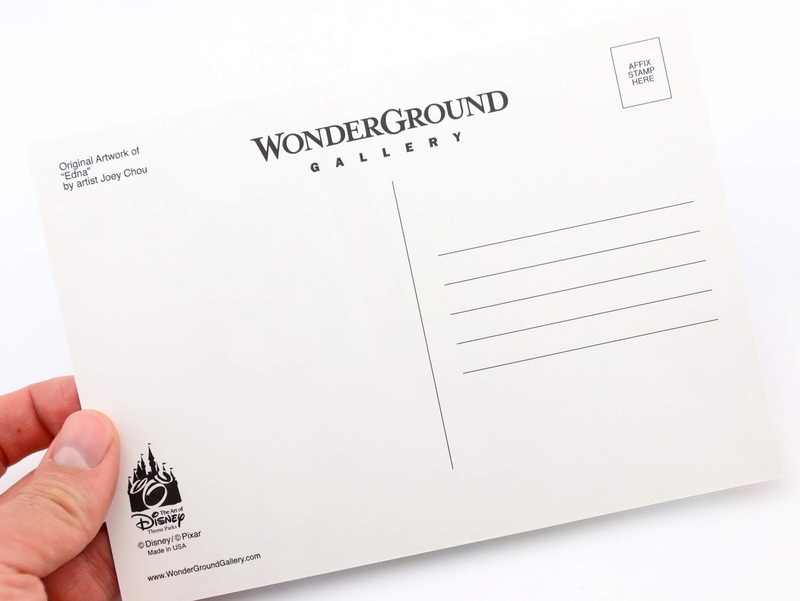 This is, per usual, the standard 4x5 postcard size (the best value for this art, retailing at only $4.95), but it's also available as a Deluxe size 14x18 matted print as well. You should still be able to find this currently at the Wonderground Gallery shop at Disneyland's Downtown Disney or Disney World's Disney Springs. If you can't make it to either of those locations, you can always check out current eBay listings using THIS DIRECT LINK. As usual, I greatly look forward to what's next from Mr. Chou. Could we expect another Incredibles inspired piece, this time focusing on the Parr family and/or the other supers and villains? Whatever it might be, consider it purchased. Find out more about Joey Chou and his art on his Tumblr, blog, and Facebook page. If you like what you see, give him a follow on Instagram and Twitter as well! Super nice guy. What are your thoughts? Anything I should have mentioned? Let me know your insights in the comments below. Lastly, a HUGE thanks to my friend Claudia who picked this up for me during one of her recent Disneyland visits. It was seriously too kind of her! I'm so lucky to have great people out there looking out for me and helping me out with my collection. It's much appreciated.